Just before the end of my daughter’s sixth birthday party, came the best part, at least for her. Presents! What’s a mom to do? Obviously, to an adult the correct response is always “thank you.” But kids don’t filter their words. They tell it like it is, and that’s part of their charm. Just like when my daughter tells me my chin is pointy (how charming of her to say!) or that there’s gray in my hair (how cute!). Saying “please” and “thank you” goes a long way in life, and the sooner youngsters learn this, the more of a habit it’ll become. The trick is to teach them in terms they understand. So I’ve begun kid-friendly manners lessons. If my daughter chews with her mouth open, I say, “Ewww, I can see your Cheerios!” If she sneezes into the open air instead of into her elbow I say, “Oh no, your germs are all over me!” The key is to get their attention so they’ll take notice of what they’re doing. 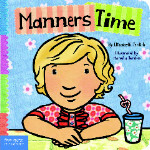 If all goes well it won’t be long before your tyke becomes the official leader of the manners police, eager to catch you not practicing what you preach. So keep those elbows off the table. 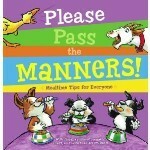 These books encourage kids to be polite. This cute story becomes interactive as readers lift flaps and spin wheels. 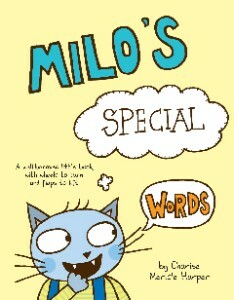 Milo asks for milk but his busy mom doesn’t move — not until he says the “special word.” Readers spin the wheel to reveal “”Flooppindoodle!” “Hocus-pocus!” and more as Milo tries different terms. Bright watercolors and lots of white space make this book appealing to look at and fun to read. 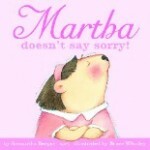 Martha is a mischievous otter who doesn’t want to apologize for doing not-so-nice things to her family. But when she discovers her family doesn’t want to be nice to her unless she apologizes, she rethinks her decision. The expressive eyes on the book’s characters and simple, gentle text send a good-manners lesson to kids in a playful way. Bold, cheerful artwork and vibrant text encourage good manners in this engaging board book: “Hello is how you greet someone. Do a little wave!” The last two pages include tips for caregivers. Large lift-the-flaps and silly animals help teach mealtime manners. One page says, “Please don’t carry germs to your seat.” Under the flap on the facing page, three pigs play with suds and the text says, “Wash your hands before you eat.” A chart for keeping track of manners appears at the back of the book. Mia Geiger blogs about books and parenting at http://miageiger.blogspot.com/. Follow her on Twitter at http://twitter.com/MiaGeiger.